This sermon is part three of the series “Jesus Feeds the Multitude.” In this session, we will look at the portion of Scripture where Jesus fed the people and commanded them to sit on the grass and He also had them sit in rows of hundreds and fifties. Why did Jesus do this? Every part of this account has a deep spiritual meaning. This sermon will examine the hidden message that God has placed as the incredible promise of His Second Coming that is embedded in the account of the feeding of the 5,000. 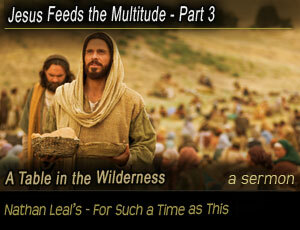 This message will also strengthen and encourage those who are alone living as God’s child in the wilderness.